Advanced Office is certified to sell, lease, and service Lexmark's award-winning single-function printers. For three decades, tens of thousands of business throughout San Diego, Orange County, Los Angeles, and Inland Empire have made Advanced Office their preferred copier and printer dealer because of our exceptional level of expertise, competitive pricing, and commitment to superior customer service. As an Authorized Lexmark Business Solutions Dealer with four locations throughout Southern California, we provide our customers with dependable, local support; special pricing; and access to Lexmark's exclusive Business Solutions line of printers. 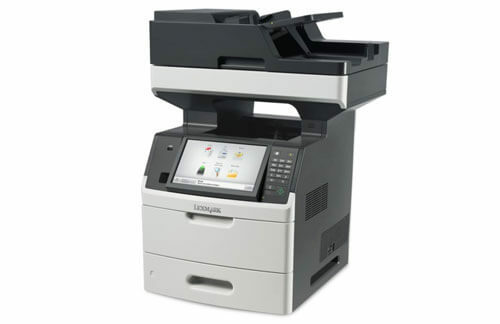 Lexmark single-function printers are available in color and black and white models with a wide variety of options, such as duplexing, high-capacity paper trays, and finishing. Many also feature user-friendly touch screens and the ability to be upgraded with valuable workflow solutions that reduce printing-related costs and improve productivity. Additionally, Lexmark is able to boast some of the fastest printing speeds in the industry. Because they have invested in the development of state-of-the-art processors, memory cards, and built-in ethernet capabilities, some of their printers can print the first page in as little as four seconds, and print up to 70 pages per minute after that. Choosing the best printer for your business will depend on the size of your workforce, monthly print volume, budget, and specific printing needs. By working with one of our experienced sales consultants, we can help narrow your choices by providing brand and model recommendations for your unique office following a thorough needs analysis at your site. Our consultants average 15 years of experience and receive ongoing product training direct from the manufacturer. Call us today to schedule an onsite analysis. When I first entered for service today I was greeted cordially and professionally by Mrs. Julie Deck. She provides the kind of greeting that lets you know you are in the 'right place . . .